Would you use a mobile app to keep track of how many pretzels you bought? 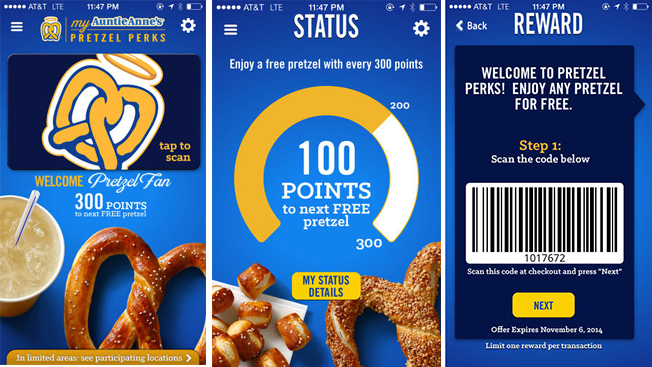 That's the idea behind Auntie Anne's national rollout of its loyalty program and its accompanying app dubbed My Pretzel Perks. The app acts as a hub, including three tiers of loyalty that rewards consumers with points that can be redeemed for free food, discounts and merchandise. My Pretzel Perks plays a key role in how Auntie Anne’s distributes and segments coupons and offers by using purchase behavior to segment offers toward different groups of consumers. Initially, consumers receive a free pretzel for signing up and can then start earning points that accumulate toward prizes and rewards. "We’re hoping to take the data that we’re learning from this with the national rollout and begin creating custom offers. We also would love to do this to better engage with our heavy influencers and our loyal users to help us develop future menu items," said Heather Neary, Auntie Anne’s CMO. My Pretzel Perks is live in 80 percent of the company’s 1,000 U.S. locations, and it will be rolled out at the remaining 20 percent of locations this month. The app has been tested since the fourth quarter of last year in Chicago and Long Island, N.Y.
To promote the national launch of the app, Auntie Anne’s will run free standing insert ads in newspapers this weekend in addition to using in-store marketing. Paid and organic social media are also planned. Auntie Anne’s has done quite a bit with mobile in the past few years with promos in certain markets like Atlanta, but this effort is one of the brand's first national campaigns to drive repeat traffic and sales to its stores. "We recognize that folks have a choice when they’re at the mall or in an airport environment, and we want them to think about Auntie Anne’s first," Neary said. "So, we want to create a more intentional relationship between our loyal guests and our brand, and we think this will help to create an enticement for them to come to us more often."